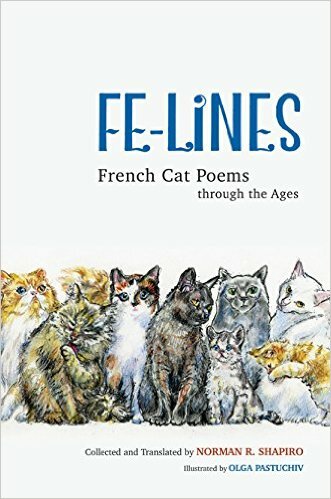 The French aren’t the only ones that love cats, but this book shows how much their love affair with the cat is. I love cats and poetry. Hence, this was a natural read for me. I love this book and highly recommend it. 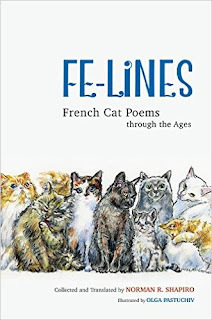 Author Norman Shapiro translates the poems, and then provides the originals in the back of the book, making this volume ideal for those who read either or both English and French. Of course, this book is all about cats. The poems cover the modern and classic. One does not have to love cats to enjoy the prose in this book. Overall, for anyone that adores poetry and/or cats, I highly recommend this book for you. Norman R. Shapiro, translator of French poetry and theater, is Distinguished Professor of Literary Translation at Wesleyan University. As Officier de l'Ordre des Arts et des Lettres de la République Française and member of the Academy of American Poets, he has published numerous award-winning collections, including The Complete Fables of Jean de La Fontaine. Olga Pastuchiv's art enlivens a number of volumes, among them her children's picture book Minas and the Fish. Until next review, stay safe. Smile! Show compassion to others. Be nice to one another. Read a book and pass it on. Review it. Be a voice for the voiceless! Cheers!